Peta, of the blog Peta Eats, was our lovely hostess for the Daring Cooks' September 2011 challenge, "Stock to Soup to Consomme". We were taught the meaning between the three dishes, how to make a crystal clear Consomme if we so chose to do so, and encouraged to share our own delicious soup recipes! Peta mentioned that it would be great to see soups from around the world; I dug into my roots (literally)! I pulled out the old faithful Cocina Criolla by Nitza Villapol, and my favorite Cuban cookbook from recent years, Havana Salsa by Viviana Carballo. Nitza Villapol was my mom's Home Economics' teacher in Cuba and I actually took a cooking class with Viviana in Miami, she was a riot! I used the best from both and the results were outrageous. This soup is so hearty I had to lower the a/c and we were still sweating! This is definitely a great recipe for winter nights, not that we have many in Miami. However, my family and friends thoroughly enjoyed it and we had enough for leftovers the following night. And I quote Bob, "It tastes even better today!" 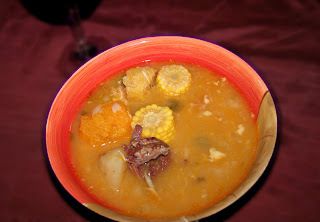 This very traditional Cuban soup named Ajiaco consists of several types of meat and loads of root vegetables. Don't let the long list of ingredients overwhelm you, the results are well worth it. As accompaniments I made jasmine rice and Yuca Buns from Ingrid Hoffman's Simply Delicioso. Cut the salt-dried beef into 3-4 large pieces and soak overnight. The following morning get rid of the water and place the beef in a large pot with the chicken pieces. Add the water, bring to a boil, then simmer for 1 hour. In the meantime to prepare the sofrito, the flavor base of the dish, heat the oil or lard in a large Dutch oven. First add the onions and green peppers and sauté until soft. Then add the garlic, tomato sauce, and mix in the crumbled bouillon cube. Add the meats, season with salt and pepper, and stir to coat with the sofrito. Once meat starts to get a little color add to the stock with all of the sofrito and let simmer for another hour. There should always be enough liquid to cover all the meats and vegetables once you add them. While the meats are cooking you can cut up your vegetables. Raise to medium heat then add the vegetables in the following order to the soup at approximately 5 minute intervals: malanga, yuca, green plantains, boniato, ripe plantains, and the pumpkin. When adding the plantains squeeze a little lemon juice into the soup to prevent it from changing the color of the broth. Once you add the pumpkin lower the heat and let simmer for 45 minutes. Last but not least you will add the corn and cook for an additional 20 minutes. Once all meats and vegetables are fork tender, turn off the heat, and add the juice of the remaining lemon. Preheat the oven to 350 degrees F. Line a baking pan with aluminum foil, and coat with nonstick cooking spray. Set aside. Combine the tapioca flour and baking powder together in a large bowl. Stir in the cheese and egg yolks. Mix until the dough forms a ball. Lightly flour a work surface and turn the dough out. Knead the dough with your hands until the dough is smooth, even-textured, and not sticky. If the dough doesn't come together or seems too stiff, then add cream, 1 tablespoon at a time, until it comes together and feels supple. Divide the dough into 10 even pieces and with your hands, roll each into a ball. Shape the balls into ovals and place them 1-inch apart on the prepared baking sheet. Bake until the rolls are pale gold (not browned), about 15 to 20 minutes. Cool on a wire rack for 5 to 10 minutes and serve while still warm. You even made yuca buns to go with the ajiaco criollo well done. The soup looks stunning great work. Cheers from Audax in Sydney Australia.